NICE recommendations are based on systematic reviews of best available evidence. When minimal evidence is available, recommendations are based on the guideline development group’s opinion of what constitutes good practice. Evidence levels for the recommendations are given in italic in square brackets. -antibody testing for coeliac disease (endomysial antibodies or tissue transglutaminase). -hydrogen breath test (for lactose intolerance and bacterial overgrowth). The emphasis on positive diagnosis, optimal clinical and cost effective management of IBS, and the importance of patient empowerment relating to their condition and self management of their medication should benefit patients with IBS. Implementing these guidelines will require many medical professionals to view IBS in a new light. The principle of a positive diagnosis of IBS will be foreign to many: reducing the amount of fibre in the diet flies in the face of many health messages, and using psychotherapy will be a new concept. However, the guidelines provide clear advice on this condition. The guideline group expects that people with IBS will be treated more effectively without the need for unnecessary investigations and referral. When referral is required, the guidelines indicate the most appropriate interventions. Information on self-help and self management as a key patient empowerment feature. The use of positive, pragmatic, diagnostic criteria for patients presenting with IBS increases patients’ confidence through positive diagnosis; increases clinicians’ confidence; and has potential for considerable NHS disinvestment in avoiding unnecessary investigations and referrals to multiple specialties. The pretest probability of organic disorders—including colon cancer, inflammatory bowel disease, thyroid disease, and lactose malabsorption—was no different in IBS populations compared with the general population. The exception was coeliac disease, which did have a higher incidence in the IBS population, leading to a recommendation that checking markers for coeliac disease was cost effective. What clearly emerges from the literature is that with careful history and physical examination, positive diagnosis of IBS is possible.7 This, augmented by simple laboratory investigations to rule out more serious underlying disease in the absence of red flag symptoms (see figure⇑), is a positive step forward for both clinicians in diagnostic practice and patients in receiving timely IBS interventions. The Guideline Development Group followed standard NICE methodology in the development of this guideline (www.nice.org.uk/page.aspx?o=114219). This is one of a series of BMJ summaries of new guidelines, which are based on the best available evidence; they will highlight important recommendations for clinical practice, especially where uncertainty or controversy exists. Contributors: Both authors contributed equally to this summary; JD is the guarantor. Funding: The National Collaborating Centre for Nursing and Supportive Care was commissioned and funded by the National Institute for Health and Clinical Excellence to write this summary. Agrawal A, Whorwell PJ. Irritable bowel syndrome: diagnosis and management. BMJ 2006;332:280-3. National Institute for Health and Clinical Excellence. Irritable bowel syndrome in adults. 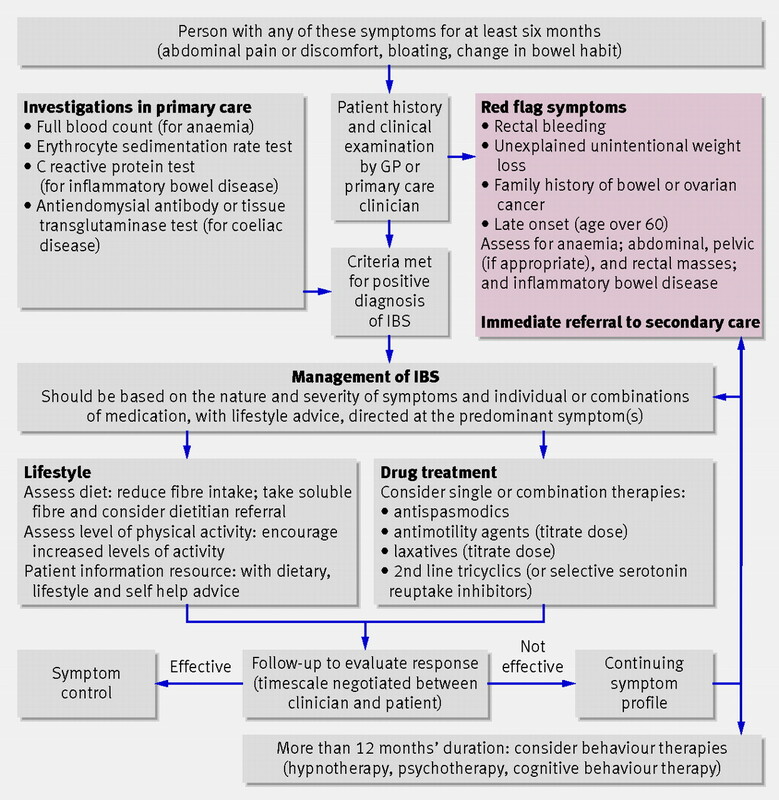 Diagnosis and management of irritable bowel syndrome in primary care. London: NICE, 2008. www.nice.org.uk/CG061. Manning AP, Thompson WG, Heaton KW, Morris AF. Towards positive diagnosis of the irritable bowel. BMJ1978;ii:653-4. Drossman DA. The functional gastrointestinal disorders and the Rome III process. Gastroenterology2006;130:1377-90. National Institute for Health and Clinical Excellence. Referral guidelines for suspected cancer. London: NICE, 2005. www.nice.org.uk/CG027. Heaton KW, Radvan J, Cripps H, Mountford RA, Braddon FE, Hughes AO. Defecation frequency and timing, and stool form in the general population: a prospective study, Gut1992;33:818-24. Morgan T, Robson KM. Irritable bowel syndrome: diagnosis is based on clinical criteria. Postgrad Med2002;112:30-41.